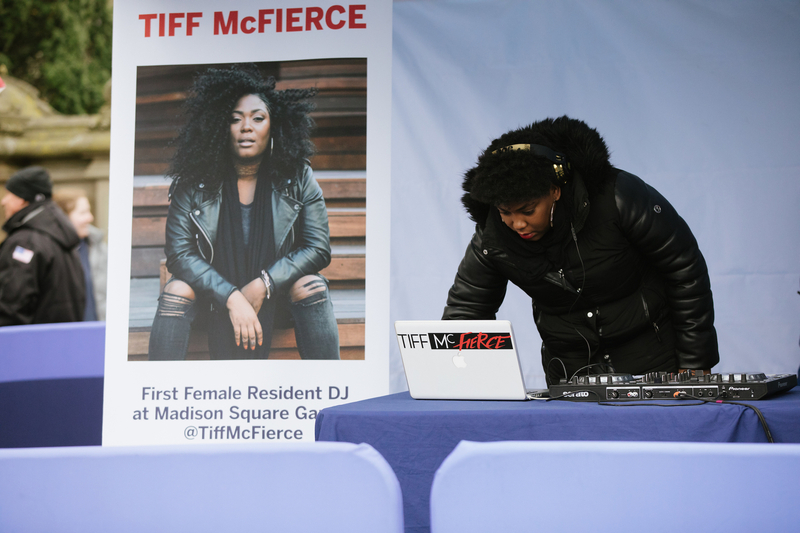 This Sunday at the SHAPE Women’s Half Marathon, runners will be greeted at the finish line by the beats of Tiff McFierce, the first woman to become a resident DJ at Madison Square Garden. More than just a trailblazer in her field and expert music curator, Tiff is a wellness advocate who inspires people to get moving. We had the opportunity to talk to Tiff this week about her career, what she is looking forward to about the race, and what advice she has for the women she’ll be seeing at the finish line. For those who don’t know, how would you describe your journey from being a professional dancer to becoming the first woman resident DJ at Madison Square Garden? I’ve been DJing for almost eight years, so I just worked super hard at my craft. I love music, especially growing up with it all around me and dancing professionally since age 4. I knew I wanted to be a DJ in elementary school. Putting things together and using mediums of music and movement to do that have always been something I’ve loved doing. I was already a known DJ before having a residency at MSG. #WomenRunTheWorld. What advice would you give to young women today chasing their goals? I work a lot with young women, particularly closely with the girls through a nonprofit organization I’m on the board for called The Girls Circle. I always give the advice of being true to yourself and allowing yourself as a young woman to explore your passions and studying your crafts. All of that along with practicing self-acceptance makes it easier to align with purpose. I believe that is how your goals and dreams manifest. When you were asked to perform at the SHAPE Women’s Half-Marathon in 2018, what was your initial reaction? I was initially asked to be an honoree and DJ the finish line of the 2018 SHAPE Women’s Half Marathon and I was very humbled and honored. SHAPE Magazine felt I embody inspiration, change, and strength and to be a part of a race that embodies that—it’s an amazing feeling! I’m excited to be back this year as an honoree speaking on the Women Run the World Panel with amazing, inspirational women and DJing the finish line once again! I was in tears race day last year. The energy I shared with thousands of women in my hometown, in Central Park was MAGNETIC! How would you describe the link between sports and music? Sports and music are siblings. As a professional dancer and former athlete, I feel that music plays a huge role in training for any sport, as well as sporting events. I curated a specific playlist on SHAPE Magazine’s Spotify as well as wrote an article on how to build your perfect training and race-day playlist because music is such a driving force in sports and life. What are you most looking forward to on Sunday at the race? I truly am looking forward to being inspired by all of the women running! There is nothing like seeing thousands of women crushing it. All ages of women coming together for women is just such a beautiful thing. I love it. It is so full of light and love, and I look forward to giving them my energy as well from DJing. MSG and Central Park. Two iconic, but two very different venues. Is your approach different for a park versus an arena? I approach every venue and event differently based on the crowd and musical needs. But whether it’s an arena, Central Park, a festival, or a party, one thing that remains the same is reading the crowd. No matter how much you might prepare for something, if you don’t know how to read people, truly connect with them through the music, and have vast music knowledge, what you prepared won’t always work. What songs inspire you or really stand out when you are preparing for an event like the SHAPE Women’s Half-Marathon? Anything that celebrates women and our strength. Songs that talk about how great we are and how we can achieve anything, songs that make us feel empowered, songs that make us want to dance, want to run faster. I’m personally for “me songs” that connect us to ourselves. I’m really big on lyrics, musical arrangement, and vibration as a gatekeeper of sound. Those types of songs are always what I would play at an event like the SHAPE Women’s Half Marathon. Any final message you want to send out to the women running the SHAPE Women’s Half Marathon? For the women running the race on Sunday, I would tell them to breathe. Not just in the way of breathing while you run but really connecting to your breath and taking in the present moment of what they’re doing and how amazing that is and how amazing they are for doing it. I believe meditation and movement go hand-in-hand and I feel like the best advice I could give them is to merge them together and look at all their sisters running next to them and embrace that energy, especially while they cross the finish line. Women run the world. You can catch Tiff in person Saturday, April 13 at the NYRR RUNCENTER as an honoree and panelist for the Women Run the World™ Panel where she will be sitting down with other amazing women to discuss topics of female leadership and empowerment, and at the finish line of the SHAPE Women’s Half Marathon on Sunday, April 14! You can also keep up with Tiff on her social media channels @TiffMcFierce.